This truck has got to be special!” says truck artist Zarrar to Chinar Gul, a truck driver from Pakistan. Gulwho drives along the mountain roads of the Karakoram and the Hindu Kushhas finally acquired his own vehicle and wants it painted beautifully. As Zarrar gets to work, Gul waits in the yard, thinking about his many journeys, the splendor of the hills and the intricacies of truck artuntil everything is at last ready and it’s time to be off, on the road again! 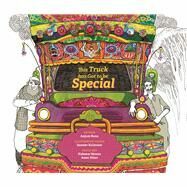 A richly imagined collaboration between a Pakistani writer, truck artists and an Indian illustrator, this book celebrates the energy and joy of Pakistani truck art as well as the artists whose skill and labor breathe life into it. All along, the bold graphic vigor of truck art tells its own story. Anjum Rana is a Pakistan-based interior designer who works with truck artists on furniture, walls, household objects as well as objects d’art. Through the initiative Tribal Truck Art, she has helped develop opportunities and contexts for truck artists to practice their craft in sustainable ways. She is committed to bringing this art into mainstream cultural life and give it the recognition that it so richly deserves. Anjum Rana is a recipient of the UNESCO Seal of Excellence in Handicrafts Award in 2008. Hakeem Nawaz and Amer Khan are truck artists who work closely with Anjum Rana. They were trained from their early teenage years by elders in their family, and today are acknowledged masters of the art form. In the art projects they undertake with Anjum, they have retained their original brush-strokes, but have also grown adept at drawing on smaller surfaces as larger ones. Illustrator and designer Sameer Kulavoor lives in Mumbai, India. His work lies in the intersection of graphic design, contemporary illustration and art  and he has his own studio, Bombay Duck Designs. He publishes artbooks and zines which feature characteristic mannerisms and images of urban life, design and culture.